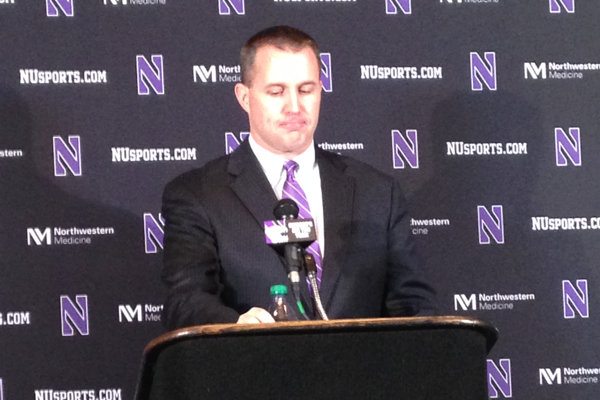 Northwestern coach Pat Fitzgerald delivers his annual Signing Day news conference. Fitzgerald welcomed 15 high school seniors who have signed National Letters of Intent to join the Wildcats. Pat Fitzgerald could not help himself Wednesday. After opening his Signing Day news conference with a joke, the winningest football coach in Northwestern history just kept rolling. One reporter made the mistake of amending Fitzgerald’s favorite phrase to “stats are ‘sort of’ for losers” during a question, tossing up a soft lob to the confident coach. Fitzgerald’s flippant attitude set the theme for the rest of the conference: one of absurdity. From the coach’s philosophical musings on the Internet, his love, takedown and then subsequent re-defense of Twitter and constant criticism of the recruiting process, Fitzgerald bordered on performance art in his effort to downplay the hype surrounding National Signing Day. The coach’s entertaining style did lead to some contentious moments. During the conference, Fitzgerald noted that “systemic changes” within NU now allow him to enroll players early, or even grayshirt signees. When asked to expand on those changes, Fitzgerald retreated to his Cold War bunker. Later, Fitzgerald admitted he helped sell recruits on joining the Wildcats by teasing the new on-campus athletic facility to be built near Lakeside Field. Although the recruits are told projections of when the facility will open, Fitzgerald declined to share those projections publicly. The “none of your business” attitude is an extension of Fitzgerald’s regular season, during which injuries were comically classified or at times outright hidden from the public. Fitzgerald’s deft balance of humor and defiance shined brightest in his criticism of college football’s recruiting culture. 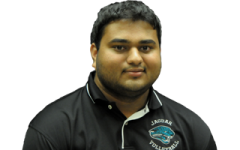 He expressed his disdain for Internet-based reports while rejecting NU’s long-time protocol of revoking scholarships of committed players who schedule other visits. What’s right for NU appears to be successful recruiting classes. For all of Fitzgerald’s grandstanding, he was backed up Wednesday by another group of athletes that should continue to push the Cats into the upper half of the Big Ten. Highlights include Justin Jackson, a running back who Fitzgerald said put up some of the best high school numbers he’d ever seen — Jackson rushed for 3,171 yards and 38 touchdowns in 2013. Fitzgerald also praised quarterback Clayton Thorson as one of the smartest kids he’d ever signed. And running back Auston Anderson chose NU over his in-state powerhouse Texas. Behind the veneer of Fitzgerald’s stand-up routine and Internet hatred, the coach also revealed his soft side. He reminisced on his days as recruiting coordinator before he was a head coach, traveling around the country to watch high school kids play in person. Now, Fitzgerald relishes the time during recruiting season when he can stay at home with his wife and kids while others are tasked with hitting the road. And even with all the baggage surrounding recruiting, such as coaches who oversign or the inflation of young egos, Fitzgerald admitted he still enjoys that part of the job.